Deep Jyoti Charitable Trust (DJCT) is a three year old New Delhi based NGO providing formal and non formal education to under privileged children dwelling in the backward region of Supaul district in Bihar. Supaul is one of the country's 250 most backward places in India (source: Ministry of Panchayati Raj, 2006). Besides providing elementary education, DJCT also offers vocational training, basic health knowledge and nutrition to marginalized children and adults to bring a positive change in their lives. DJCT's programmes are designed in line with its long term objective to create leaders and social reformers for tomorrow who can lead several political, social and economic initiatives for a better community. Despite no financial aid from external sources such as the government or companies/foundations; DJCT’s performance has been noteworthy each year since inception in 2010. It is important to highlight that DJCT has been continuously achieving new milestones with unstinted support received from local and international volunteers. 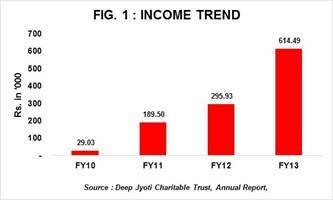 Total Income: DJCT is a small sized NGO with annual income of Rs0.6mn in FY13 with a y-o-y growth of 108% over FY12 (Refer Fig. 1). Individual donations have accounted for almost all of DJCT’s income in FY13. Interest income accounts to less than 1% of total income in FY13. 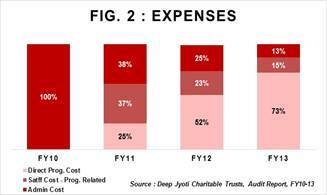 Direct Programme Expenses: During FY13, 87% of total expenses was incurred towards total direct programme expenses. This has increased from Rs0.2mn in FY12 to FY0.5mn in FY13 (Refer fig. 2). It should be noted that small sized NGOs include staff salaries under the head of programme expenses. For DJCT, only 14% out of 87% was incurred for staff salaries in FY13. During this period, DJCT introduced vocational training programmes for women and conducted sanitation drives which led to an increase in direct programme expenses; thus exceeding income received in FY13. Overhead Expenses: In FY13, overhead expenses accounted for only 6% of total expenses incurred during the year. Since FY10, DJCT has demonstrated significant y-o-y decline in its overhead expenses. This has declined from 64% in FY10 to 5% in FY13. Corpus/General Funds/Liabilities: Being a young organization and due to its inherent challenges of managing funds, DJCT has not yet been able to park funds aside for its corpus. General Funds has increased nearly five times in FY13. This is owing to relatively larger surplus generated in FY12 over previous years. The organization has borrowed no funds from its Trustees or from external sources. Self Sufficiency Ratio: The NGO maintained self-sufficiency ratio of 103% in FY13. This has declined from 118% in FY12 owing to substantial increase in total expenditure in FY13. Dependence on Individual Donors: DJCT is largely dependent (99% for FY10-FY13) on select individual donors. This could be a risk for the longevity and growth of the NGO and remains a matter of concern. DJCT has applied for FCRA registration and is expected to receive the FCRA license by January 2014. This may widen the avenues for funding. Inadequate Funds: DJCT has spent considerable amount of time in aligning its focus to build a strong entity and a quality platform. It was only in FY13 DJCT started reaching out to external sources like the state government, corporate houses and other funding agencies for financial and strategic support. As there is no large donor backing DJCT, potential donors are reluctant to make the first move. The slow fund raising process is affecting their growth plans. Lack of Professional Manpower: DJCT has received good response from families willing to send their children to schools. However, due to low compensation offered to employees, quality teachers are reluctant to join DJCT. They had to reduce number of enrollments from 300 to 100 in FY13 due to low staff. There have been instances where international volunteers have shown an interest to serve the organization, but due to lack of security support from local government bodies, the organization is hesitant to appoint these volunteers in a remote location such as Supaul district in Bihar. The Board members meet every three months formally and every week informally. The core team composed of three board members prior to setting up DJCT have worked together for five years in an education focused New Delhi based NGO - Project WHY. Mr. Prabin Kumar Ghimire, Founder Trustee has a total work experience of 15 years as a social activist. The organization is currently registered with Give India.